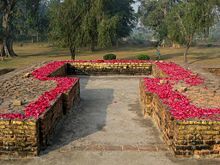 Gandhakuti (Buddha's hut) in Jetavana. Coordinates: 27°31′02″N 82°03′02″E﻿ / ﻿27.517073, 82.050619 Srāvastī or Sāvatthī (Hindi: श्रावस्ती), one of the six largest cities in India during Gautama Buddha's lifetime, is situated on the banks of the river Aciravati, today's Rapti River. It is the capital city of the kingdom of Kosala, located in the fertile Gangetic plains in the modern Gonda district of Uttar Pradesh. Buddha spent most of his monastic life (25 years) in Sravasti. During that time, the king of Kosala became a disciple of Buddha. The main monasteries in Sravasti were Jetavana and the Pubbarama. According to tradition, Buddha spent 19 rainy seasons in Jetavana monastery and six in Pubbarama monastery. He spent more time in Sravasti than in any other place and performed his major miracles there, including the Twin Miracle under the Gandamba tree. 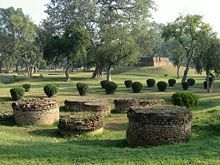 Jetavana is a historical park, with remains of many ancient buildings including monasteries, huts, such as the Gandhakuti and the Kosambakuti, and stupas. The second-holiest tree of Buddhism, and the Anandabodhi Tree, stand in Jetavana. The Gandhakuti, where Buddha often stayed, is the most revered place in Jetavana. Savatthi and Jetavana form a part of the Buddhist pilgrim route in Northern India. Buddhists from Thailand, South Korea, Sri Lanka, Myanmar, Tibet and China have built monasteries in Sravasti. The origin of Sravasti is uncertain with sources presenting differing stories. According to the epic Ramayana, Sravasti was a new city created for Lava, the son of Raghava Rama. 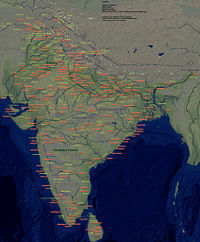 Rama divided his Kosala Kingdom into two parts. He installed his son, Lava, at Sravasti and another son, Kusha, at Kushavati. According to the Mahabharata, the legendary king Shravasta founded Sravasti, naming the city "Savatthi" after the sage Savattha who practiced there. According to another tradition, at a caravanserai people greeted each other by "Kim bhandam atthi." They then replied "Sabbam atthi," meaning "we have all things," as in everything. The city took on the reply as its name. Savatthi, located on the banks of the river Aciravati (now called the Rapti river), served as the capital city of the kingdom of Kosala. Its king, Pasenadi, practiced as a disciple of Buddha. A beautiful city, Sravasti enjoyed wealth from abundant crops and a diversity of crafts. Buddhaghosa states that, in the Buddha's time, 57,000 families dwelt in Savatthi. The chief city in the country of Kasi Kosala, it measured 300 leagues in length with 80,000 villages. He put the population of Sávatthi at 180 million. The road from Rajagaha to Savatthi passed through Vesali. The Parayanavagga lists resting places between the two cities, among them Setavya, Kapilavatthu, Kusinara, Pava and Bhoganagara. Further on, a road ran southwards from Savatthi through Saketa to Kosambi. Toranavatthu sat between Saketa and Savatthi. The Buddha passed the greater part of his monastic life in Savatthi. He visited Savatthi for the first time at the invitation of Anathapindika, whom he met in Rajagaha. Jetavana and the Pubbarama were the main monasteries in Sravasti, Pasenadi building Rajakarama monastery opposite Jetavana. Andhavana, a dark forest where some monks and nuns lived, lay close by the city. A fishing village of five hundred families sat outside the city gate of Savatthi. Anathapindika, Visakha, Suppavasa and Pasenadi had been the chief patrons of the Buddha in the town. When Bandhula left Vesali, he moved to Savatthi. According to Woodward, of the four Nikayas, 871 suttas had been preached in Savatthi; 844 of those in Jetavana, 23 in the Pubbarama, and four in the suburbs of Savatthi. Those suttas are made up of six in the Digha Nikaya, 75 in the Majjhima Nikaya, 736 in the Samyutta Nikaya, and 54 in the Anguttara Nikaya. The Commentaries state that the Buddha spent 25e rainy seasons in Sávatthi, with 20 spent elsewhere. Of the 25 rainy seasons Buddha lived in Sravasti, he spent 19 in Jetavana monastery and six in Pubbarama monastery. Buddha spent longer in Sravasti than any other place, giving the most discourses and teachings. Buddha displayed his supernatural powers, silencing critics who denied his ability to perform miracles, at a place in Savatthi called the Twin Miracle (Pali: Yamaka Patihara). 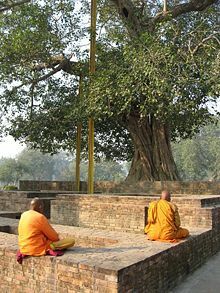 Buddhist commentaries place the scene of each Buddha's Yamaka pátiháriya in Savatthi ; Gautama Buddha performed that miracle under the Gandamba tree. The Chinese pilgrim Hiouen Thsang (Xuanzang 600 - 664) found the old city in ruins, but recorded the sites of various buildings. The ancient city walls of Savatthi still stand. 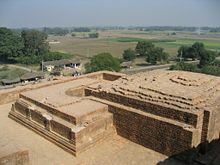 Within those walls the remains of three ancient buildings can be visited: Angulimala's stupa, Anathapindika's stupa, and an old temple dedicated to a Jain Tirthankara. Outside of Savatthi the stupa where the Twin Miracle (Pali:Yamaka Patihara) took place stands. The site of Jetavana monastery constitutes an important pilgrim destination, with meditation and chanting performed at the Gandhakuti (Buddha's hut) and the Anandabodhi tree. Buddhist monks from Thailand, South Korea, Sri Lanka, Myanmar, Tibet and China have constructed monasteries at Sravasti. Jetavana had been one of the most esteemed of the monasteries in India during Buddha's lifetime. The second monastery donated to Buddha, after the Veluvana in Rajagaha, Jetavana sits just outside the old city of Savatthi. Buddha gave many teachings and discourses in Jetavana, more than in any other place. Buddha spent 19 (out of 45) rainy-seasons (also pansah or vassa) at Jetavana, more than any other monastery. After the Migāramātupāsāda (a second monastery erected at Pubbarama, close to Savatthi) had been established, the Buddha would dwell alternately in Jetavana and Migāramātupāsāda, often spending the day in one and the night in the other. Buddhist monks meditating under the Anandabodhi tree, Jetavana Monastery. When the Buddha accepted Anāthapindika's invitation to visit Sāvatthi, Anāthapindika, seeking a suitable place for the Buddha's residence, discovered a park belonging to Jetakumāra. When he asked to be allowed to buy it, Jeta replied: "Not even if you could cover the whole place with money." Anāthapindika said that he would buy it at that price, and when Jeta answered that he had had no intention of making a bargain, the matter went before the Lords of Justice, who decided that if the price mentioned were paid, Anāthapindika had the right of purchase. Anāthapindika had gold brought down in carts and covered Jetavana with pieces laid side by side. A bas-relief at the Bharhut Tope illustrates that incident. The money brought in the first journey proved insufficient to cover one small spot near the gateway. So Anāthapindika sent his servants back for more, but Jeta, inspired by Anāthapindika's earnestness, offered to give that spot. Anāthapindika agreed and Jeta erected a gateway, with a room over it, there. Anāthapindika built in the grounds dwelling rooms, retiring rooms, store rooms and service halls, halls with fireplaces, closets, cloisters, halls for exercise, wells, bathrooms, ponds, and open and roofed sheds. MA.i.50; UdA.56f states that Anāthapindika paid 18 crores for the purchase of the site, all of which Jeta spent in the construction of the gateway gifted by him. (The gateway was evidently an imposing structure)). Jeta gave, besides, many valuable trees for timber. Anāthapindika himself spent 54 crores in connection with the purchase of the park and the buildings erected in it. The ceremony of dedication was one of great splendor. Not only Anāthapindika himself, but his whole family took part. His son with 500 other youths, his wife with 500 other noble women, and his daughters Mahā Subhaddā and Cūla Subhaddā with 500 other maidens attended. Five hundred bankers accompanied Anāthapindika. The festivities in connection with the dedication lasted for nine months. Some of the chief buildings attached to the Jetavana have mentioned by name, viz., Mahāgandhakuti, Kaverimandalamāla, Kosambakuti and Candanamāla. Some detached buildings have also been mentioned - e.g., the Ambalakotthaka-āsanasālā. According to Tibetan sources, the devas of Tusita planned the vihāra which contained 60 large halls and 60 small halls. The Dulva also gives details of the decorative scheme of the vihāra. Anāthapindika built all of those. Pasenadi constructed Salalaghara, another large building. A guardian deity had been placed over the gateway to prevent evildoers from entering the grounds. A rājayatana-tree, the residence of the god Samiddhisumana, stood just outside the monastery. Jetavanapokkharanī, a large pond, may have been on the grounds. The grounds themselves were a wooded grove (arañña). A mango-grove stood on the outskirts of the monastery. Anāthapindika planted the Bodhi-tree, Anandabodhi, in front of the gateway. A cave, which became famous as the Kapallapūvapabbhāra on account of an incident connected with Macchariyakosiya, lay close by the gateway. According to the Divyāvadāna, the thūpas of Sāriputta and Moggallāna were on the grounds of Jetavana and existed until the time of Asoka. Both Fa Hien and Houien Thsang give descriptions of other incidents connected with the Buddha, which took place in the neighbourhood of Jetavana - e.g., the murder of Sundarikā, the calumny of Ciñcā, and Devadatta's attempt to poison the Buddha, among others. 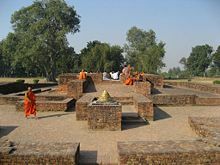 Scene in Jetavana, showing some small stupas. The space covered by the four bedposts of the Buddha's Gandhakuti in Jetavana is one of the four avijahitatthānāni. All Buddhas possess the same, though the size of the actual vihāra differs in the case of the various Buddhas. For Vipassī Buddha, the setthi Punabbasumitta built a monastery extends for a whole league, while for Sikhī, the setthi Sirivaddha made one covering three gavutas. The Sanghārāma built by Sotthiya for Vessabhū measured half a league in extent, while that erected by Accuta for Kakusandha covered only one gāvuta. Konagamana's monastery, built by the setthi Ugga, extended for half a gāvuta, while Kassapa's built by Sumangala covered sixteen karīsas. Anāthapindika's monastery covered a space of 18 karīsas. According to a description given by Fa Hien, the vihāra originally had seven sections or stories, filled with various offerings, embroidered banners, and canopies. Lamps burnt from dusk to dawn. One day a rat, holding in its mouth a lamp wick, set fire to the banners and canopies, destroying entirely the seven sections or stories. The vihāra was later rebuilt in two sections. Two main entrances, one on the east, one on the west, were built. Fa Hsien found thūpas erected at the places connected with the Buddha, each with its name inscribed. Near Jetavana is a monastery of the heretics where Ciñcāmānavikā spent her nights hatching her conspiracy against the Buddha. Once the heretics bribed Pasenadi to let them make a rival settlement behind Jetavana, but the Buddha frustrated their plans. There seems to have been a playground just outside Jetavana used by the children of the neighborhood, who, when thirsty, would go into Jetavana to drink. The high road to Sāvatthi passed by the edge of Jetavana, and travelers would enter the park to rest and refresh themselves. Anandabodhi tree in Jetavana monastery. City walls of Sravasti, with ancient city gate. ↑ Alexander Cunningham and Vasudeva S. Agarwala. The Stūpa of Bharhut: a buddhist monument ornamented with numerous sculptures illustr. of buddhist legend and history in the 3. century B.C.E. ([Werke] Complete works, 4. Varanasi: Indological Book House, 1962- ), Pl.lvii., 84-86. ↑ AA.i.264; Here the Buddha often bathed; J.i.329ff. That may have been the Pubbakotthaka referred to at A.iii.345. See S.v.220 for contradictory evidence. Devadatta swallowed up in Avīci near that pond (J.iv.158)). Ahir, D. C. Sravasti: where the Buddha spent 25 retreats. Delhi: Buddhist World Press, 2009. ISBN 9788190638852. Cunningham, Alexander. Reports of operations of the archæological surveyer to the Government of India during the seasons of 1861-1865. 1864. OCLC 35669966. __________, and Vasudeva S. Agarwala. The Stūpa of Bharhut: a buddhist monument ornamented with numerous sculptures illustr. of buddhist legend and history in the 3. century B.C.E. Cunningham: [Werke] Complete works, 4. Varanasi: Indological Book House, 1962. OCLC 252284930. Law, Bimala Charan. Śrāvastī in Indian literature. (Memoirs of the Archaeological Survey of India, 50). Delhi: Swati Publ., 1991. OCLC 255895081. Sahni, Daya Ram, and Daya Ram Sahni. "A Buddhist image inscription from 'Srāvastī." 1909. OCLC 79844691. Sinha, Krishna K. Excavations of Sravasti, 1959. Varanasi: Banaras Hindu University, 1967. OCLC 693627. Venkataramayya, M. Śrāvastī. New Delhi: Archaeological Survey of India, 1981. OCLC 11828579. Vogel, Jean Philippe. The site of Sravasti. [London]: [University of London. Royal Asiatic society], 1908. OCLC 236130631. All links retrieved October 19, 2015. This page was last modified on 19 October 2015, at 20:25.